How did Glasgow’s drug and alcohol services join together to strengthen their pull on the community? Read our cover story and be inspired. GRANDweek has set in motion some highly effective partnership working. A new government report pledges to stop the slide into homelessness, particularly for those with drug and alcohol issues. But are these empty words in the context of welfare cuts? By using partnerships to create an imaginative week of activities, Glasgow is successfully involving the community in drug and alcohol awareness, as Stephen Birrell explains. Galvanising the service user movement in the UK before returning to Canada’s inferior drug and alcohol treatment system has given Bill Nelles a unique perspective on treatment policy. The arts can play a vital and powerful role in recovery, says Katrina Lahmann. Stigma and prejudice still stand firmly in the way of achieving an AIDS-free generation, says Dr Chris Ford, who shares her observations on the 19th International AIDS Conference. 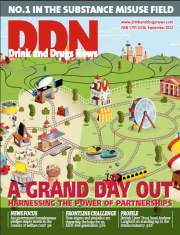 As liver disease rates continue to rise, David Gilliver talks to British Liver Trust chief executive Andrew Langford about awareness and taking on the drinks industry. Recovery coaching is quietly transforming the world of recovery, says Anthony Eldridge Rogers.